Plans to redevelop RLYC Club & Marina includes Superyacht Berth Expansion Feb. 6, 2015. 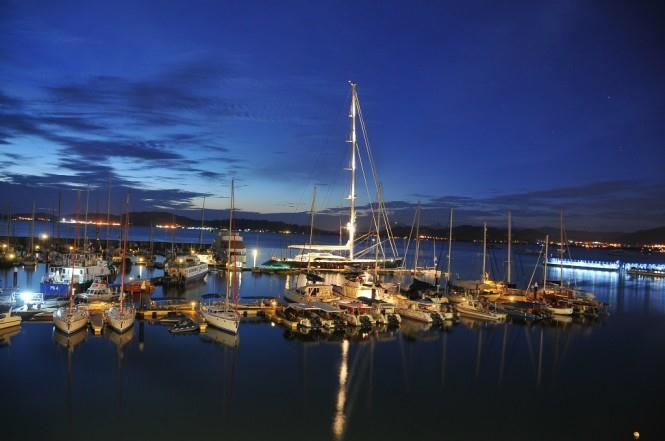 The Royal Langkawi Yacht Club (RLYC) is planning to “redevelop its club and marina to enhance its facilities and services, and meet the demands of the sailing and yachting community in the region and beyond”, reports Captain Charlie Dwyer of Asia Pacific Superyachts in Langkawi, Malaysia. redevelopment plans include the expansion of mega-yacht berths. Captain Dwyer cautions captains to note due to the RLYC redevelopment project, club facilities will temporarily cease operations from 16 February 2015 until the end of October 2015.The world-class 205 berth marina is situated on the south-east corner of Langkawi Island close to the island’s main town, providing excellent access to duty-free shops and business facilities. Located on the mystical island of Langkawi in the northwest of Peninsular Malaysia, RLYC is positioned as the ideal stopover for travelers whether by land or sea. The Langkawi archipelago comprises 104 beautiful jungle-covered islands of which only two are inhabited. Established 18 years ago, the club has maintained its status as a prominent destination for sailors by providing world-class marina and berthing facilities as well as food and beverage services in an idyllic island setting. The RLYC accommodates mega-yachts up to 60 m with a low tide depth of 3 meters. Pontoons have direct electricity, fuel and water supply and offer high-speed WiFi internet. Immigration and Customs are conveniently situated just a few minutes’ walk from the RLYC marina.